When the Government introduced Charter Schools through pretending it was just part of an Act Party coalition agreement, it was actually a long term attempt to break New Zealand's public education model. The privatisation of public services is always a goal of National Governments and there has been a long time animosity towards the education unions. NZEI and PPTA are two of the strongest, high density membership unions in New Zealand and any system that could weaken their collective agreements and reduce their influence was worth a try. Lesley Longstone had been appointed to head the Ministry of Education well before the ACT coalition agreement was being negotiated. Her past job was the implementation of the Charter School system in the UK and it was clear at that stage what the Government's intentions were. The simplistic approach of the National Government blinkered them to the wider functions of the Ministry and Longstone struggled to get to grips with leading the New Zealand system. Te Pumanawa o te Wairua was one of the original five Charter Schools chosen as flagships of the new public/private system. 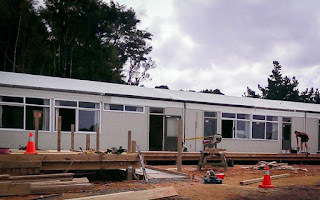 The quality of all the Charter School applicants was concerning and although there seemed to be a lack of experience within the Te Pumanawa o te Wairua Trust it was one of the better ones of a bad bunch and there was obviously the belief that it could be supported into a successful operation. Right from the beginning the school caused concerns, it spent $1.3 million on a farm with some of the setting up funds and struggled to meet basic expectations as a school. The original 60 students that started in the expensive experiment quickly dropped to 40 and the schools was allowed to bumble on for two years while providing a substandard education for the remaining students. Education Minister Hekia Parata has finally pulled the plug on Te Pumanawa o te Wairua and many of the problems she listed that led to the failure of the school are problems that all public schools in low decile communities experience, such as recruitment and retention of staff. The Government's theory of shifting outside the public system to find solutions for supporting struggling children in low decile communities was similar to buying a ticket in a lottery, there was always a slim chance that one or two may be successful. Without relying on professional experience and a fully-qualified staff, the chances of failure were actually so much greater than within the public system. Taking a gamble on a system that has had mixed success in other countries (ranked beneath us in international assessments of achievement) seemed dodgy at the time, and dodgy it has proven to be. Ideology has always trumped evidence for this Government and although promising not to introduce more Charter Schools until the original five proved their worth we now have nine and 25 more schools have applied. Over the two years of Te Pumanawa o te Wairua's operation the expenditure amounted to around $60,000 per student each year. When the overall expenditure per student in New Zealand is only between $7,000 and $9,000 per annum one can only wonder at how that money could have been better used if directed to existing schools. Parata says that the setting up of any new school costs a considerable amount, however many of the Charter Schools are being funded to set up where public schools already exist. Surely those schools would benefit from the money going to them and provide better value than spending it on a new school in the same area that may or may not deliver good outcomes. Over the last few years the National Government has squandered over $110 million on Novopay and over $14 million on a handful of Charter Schools. At the same time special education is underfunded, leaky schools are going to cost $1.5 billion to fix and around $6 billion is needed to build new schools and to address maintenance (often delayed) of existing ones. The amount of energy and expense necessary to further drive an ideological idea, with such a poor track record, is unjustifiable when so much is needed to maintain existing public schools and support the children in them. New Zealand's public education system continues to be attacked by National.